MARCOM's "Forklift Safety" Safety Game reviews for employees why it is important that they learn to recognize hazards associated with operating powered industrial trucks. Thousands of accidents and more than 100 deaths are attributed to the improper operation of forklifts and other powered industrial trucks every year. OSHA's Powered Industrial Truck Standard (29 CFR 1910.178) was revised in 1999 to make sure that all operators of these vehicles are properly trained. The Safety Game is a Jeopardy-style, computer-based training game that involves all employees in the training process. Employees are divided into teams that compete to obtain the best game score. The trainer acts as the game show “Host”, controlling the game board through the computer (the computer image is projected on a wall or screen in the classroom, or hooked up to a large monitor that all employees can see). Each Game consists of a 20 to 25 question match. Questions are divided into categories of important information from the topic. Games can be purchased alone... or with MARCOM’s videotape program on the same subject for the ultimate safety training session (show the Video, then play the Game). Games (as well as matching videos) are available on over 20 topics. 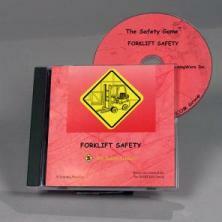 A demo of The Safety Game can be downloaded from the internet.